APA has launched a new & improved search feature which will help our members get more work: Hire An APA Pro — an online portal for finding professional photographers and crew. As an APA member, we invite you to now log on and complete your public profile. All location data has been cleared, so please begin by setting a geo-location for yourself. It doesn’t need to match your mailing address, only where you want clients to associate your area. 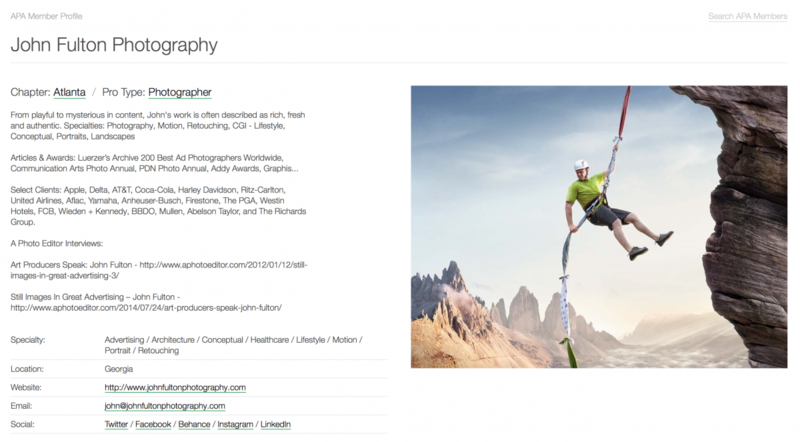 Hire An APA Pro is searchable by type (such a Photographer), specialty, name or location. The images you upload should be tagged with a specialty that reflects the image. The number of images you can upload and specialties you can tag will be based on your membership level. Links: After you have input links to your site and your social media accounts, please look yourself up by name, and check that all the links work. Check here. Hire An APA Assistant: Photographers who are also working as Photo Assistants can be showcased as both. Under specialties select “I am also an assistant” and follow the prompts. If you would like more comprehensive, step by step instructions, please let us know.